Please note: we have been informed that access to the decks on all condominiums in this building is currently prohibited due to safety concerns. Should you wish to reserve the property without use of the decks, we will discount the rent by 20% and ask you to sign a liability waiver stating you will not go on the decks. We hope that the deck replacement for the building will begin and end shortly, but at this time we do not know the schedule. 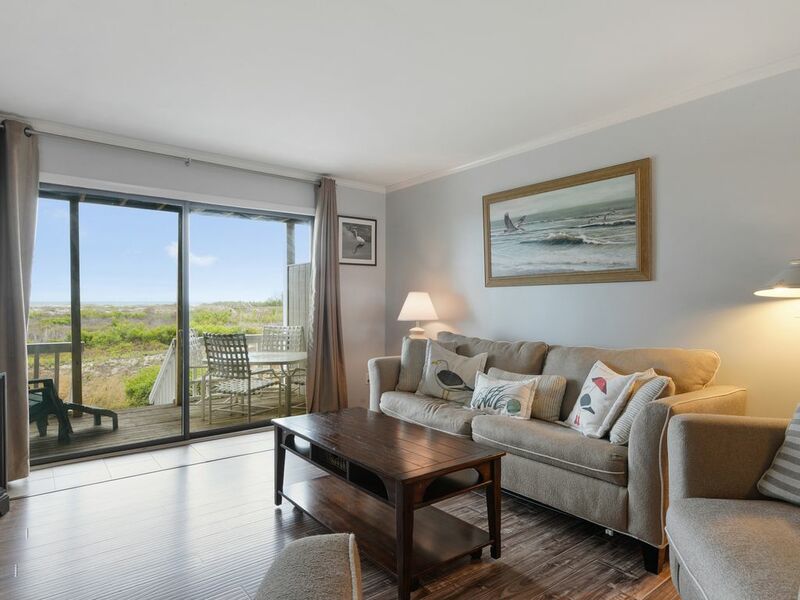 Enjoy fantastic ocean views from both the bedroom and living area, each offering their own deck. Sit and swing on the bedroom deck, or dine al fresco at the glass top table seating four on the living area deck. There is all new flooring throughout, including custom river rock floors in the half and full bath which also have new lighting fixtures and new granite counter tops. In the bedroom, the king bed invites sweet dreams and you can step right out onto the private ocean front deck and enjoy the porch swing! There is a 32" flat screen TV in the bedroom along with DVD and VCR players and a DVD/VCR library. A combined living dining area boasts a new (2016) sleeper sofa, two armchairs big enough to curl up in, and a 32" flat screen television. Kitchen upgrades include new stainless steel dishwasher, microwave, refrigerator, and glass top stove, granite counter tops and new lighting. Lots of books for your enjoyment including novels, nature, and cookbooks. This condominium will not disappoint! No pets and no smoking, please. *Seasonal dates and rates subject to change. Rates are rent only. Add departure cleaning, 10% SC taxes, 3% booking fee and vehicle gate passes. Gate pass fees are per vehicle: day pass $11; 1-5 night pass $11 PER NIGHT; 6-7 nights $70; 8-14 nights $80.00; 15-21 nights $85; 22-30 $90; 31-90 nights $100; 91-364 nights $115. *Property furnishings are subject to change and may not reflect the property pictures. This material is based upon information, which we consider reliable, but because it has been supplied by third parties, we cannot represent that it is accurate or complete, and it should not be relied upon as such. Community pools are open from April 1 through October 31. Full bath accessed through the bedroom. Half bath is accessed through the hallway between living area and bedroom. Full sized washer and dryer in the kitchen. All bath towels provided. Four beach towels provided. Located at the Beach and Racquet Club. Large selection of books including novels, local area books, cookbooks. Pools typically open April 1, close November 1. Please note: NO swimmy diapers allowed in the BRC or condominium pools. Children in swimmy diapers may use the BRC kiddie wading pool only. Starter supplies (1-2 nights) of the following are provided: paper towels, trash bags, dishwasher detergent, toilet tissue, bath and hand soap. Bike and helmet rentals are available at the Harbor Island Beach and Racquet Club. For more information call the BRC at 843-838-7254. The surrounding area offers excellent fishing, golfing, boating and sightseeing opportunities galore! Harbor Island is also a convenient day trip to the historic cities of Savannah, Georgia and Charleston, South Carolina, but we are betting you never want to leave the tranquility of Harbor Island and charm of beautiful Beaufort!